I tie on jigs a lot, so much so that it’s become almost automatic when reaching for a hook. 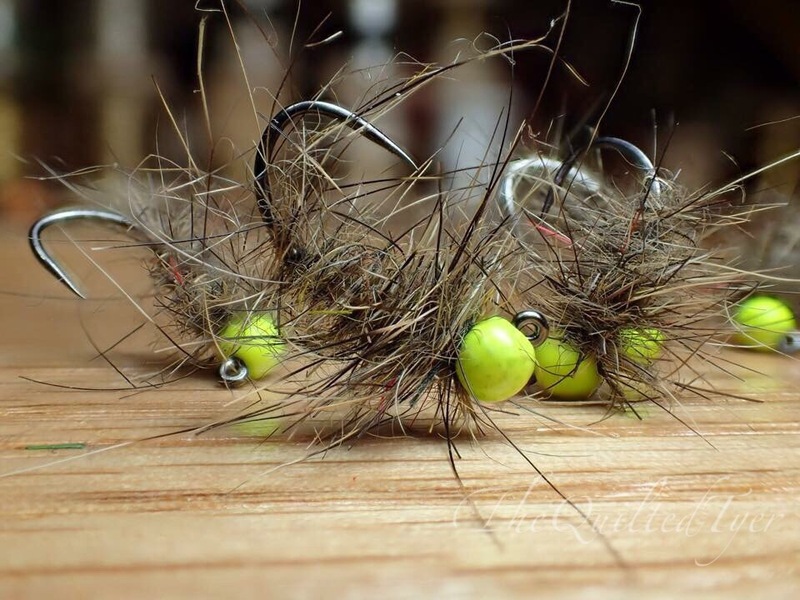 They are great for nymphing, will sink deep with a tungsten bead and extra weight under the body and ride with the hook point up on a tight line. Translating into less hangups as you are high sticking through the riffles. 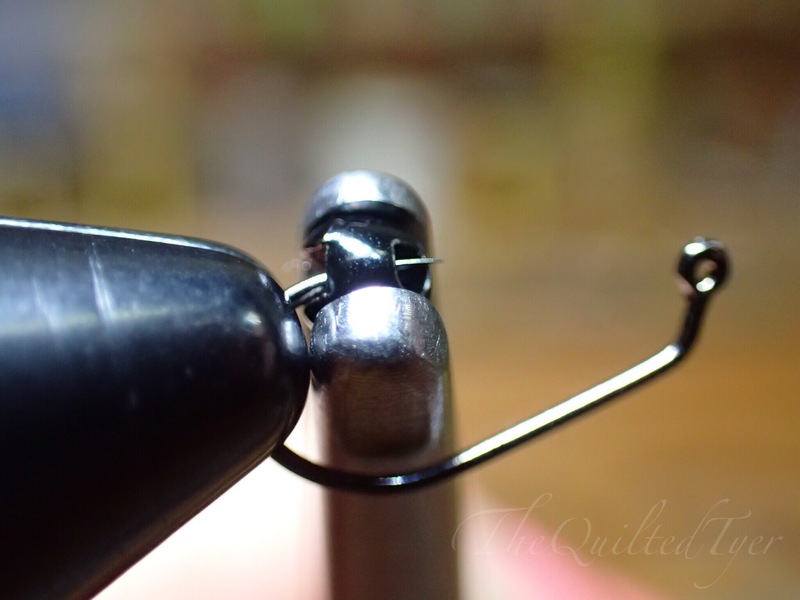 Not to say that I dont still use standard nymph hooks with brass beads when I am going to be fishing skinnier water, and need to opt for something lighter that wont barrel straight down through the water column; It’s just that I cant seem to keep myself away from them. If you are new to slotted beads you can grab a pack of them almost anywhere, but when you become heavily addicted and want them in 100 packs…(Here we a “gumball machine” as I like to call it, full of tungsten slotted beads) I recommend Rip lips Fishing. If you are a fellow chronic bead user, you may know as well as I do, that these guys have the biggest selection of beads, in brass and tungsten that you will ever see! Plus you can’t beat the prices. You can shop online but if you want to find the best selection to see right in front of you, I would suggest attending the International Fly Tying Symposium in Somerset NJ or The Fly Fishing Show in Somerset as well. Just check dates before attending in your area. 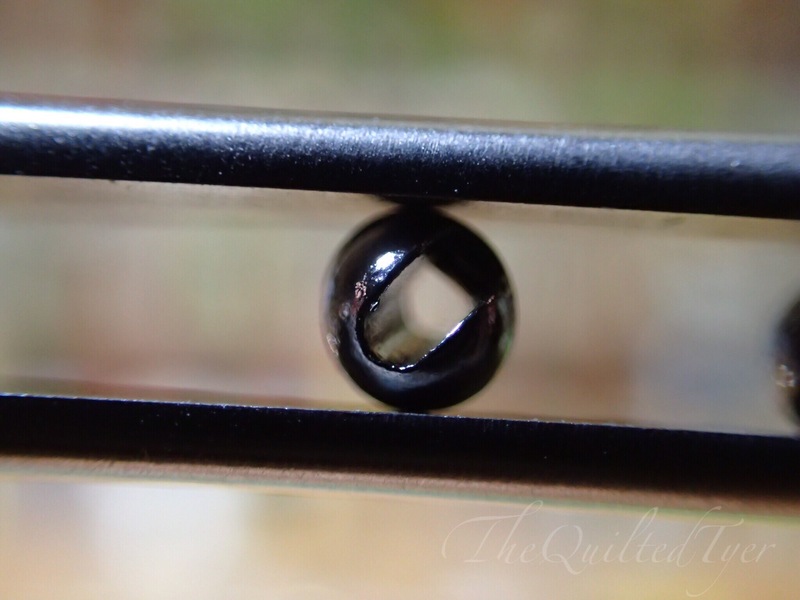 If you were to take a bead and a slotted bead and stare down the eye hole, they would look almost identical. Front of both types of tungsten beads. But if you were to take those same two beads and flip them around, you would see a noticeable difference. 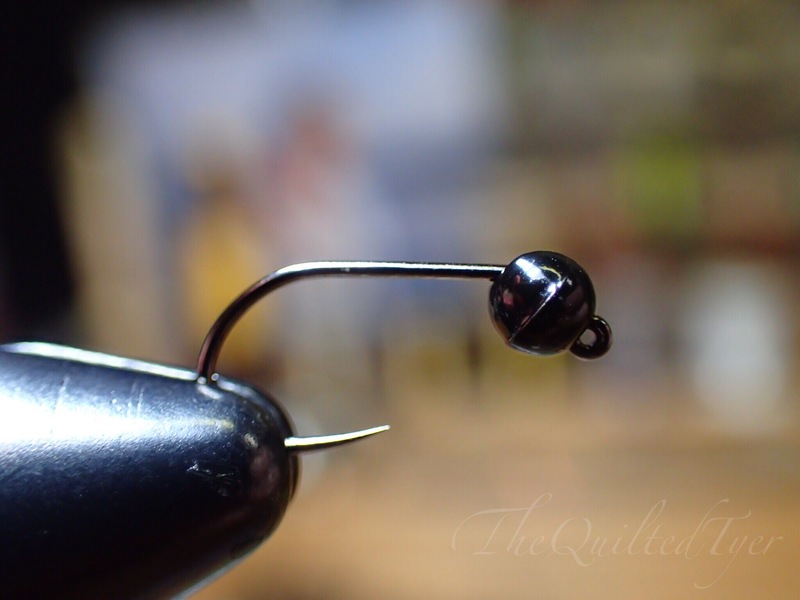 Slotted on the left and a normal tungsten bead on the right. That bead holder can be found here. Onto the problem at hand. 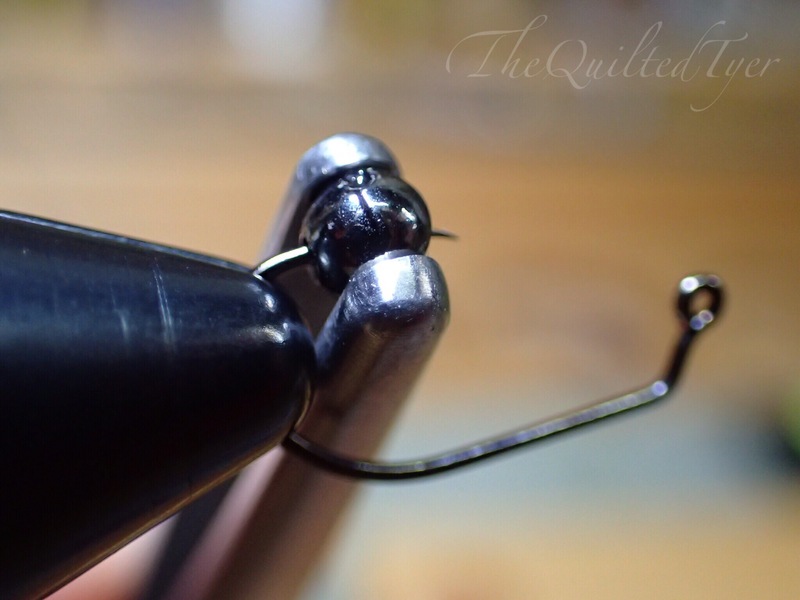 When It comes to placing your jig hook in the vise for tying, its personal preference; because whats going to happen is that you will be rotating the vise constantly so either way works. 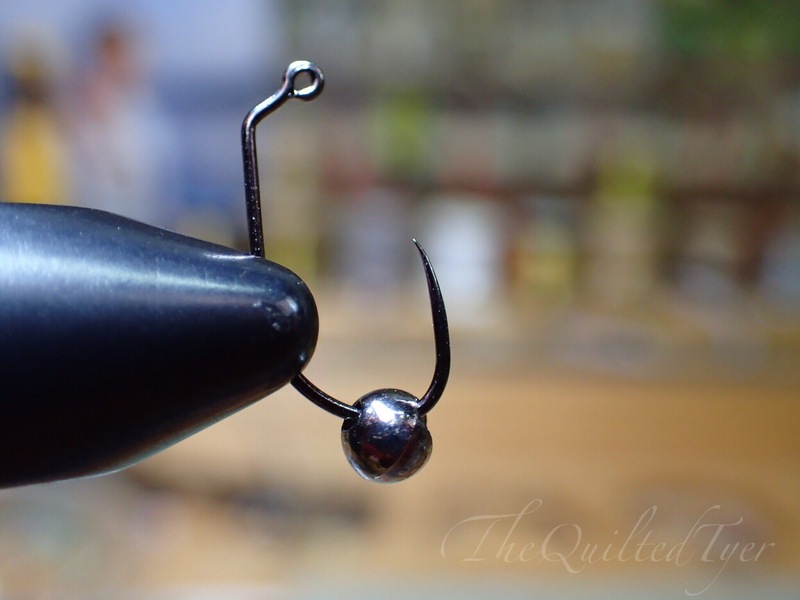 As you can see, the jig hook has a bend in the front of it just behind the eye. 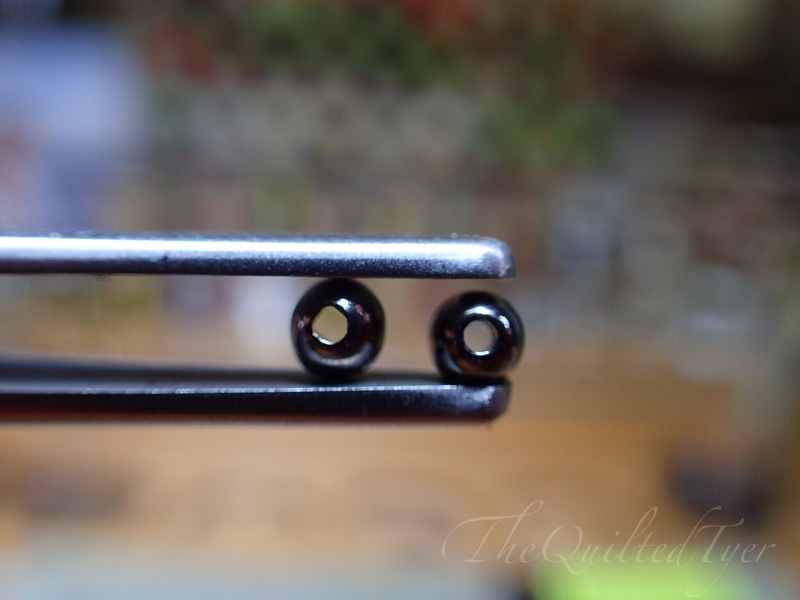 This is so that the slotted bead can sit on it in a way that will allow the bead to slide right over the hook bend. Without that slot in the bead it wouldn’t go very far. Rotated upside down… or is this right side up?.. This step-by-step below is for demonstration purposes only, I am using the pliers to give you a better view. 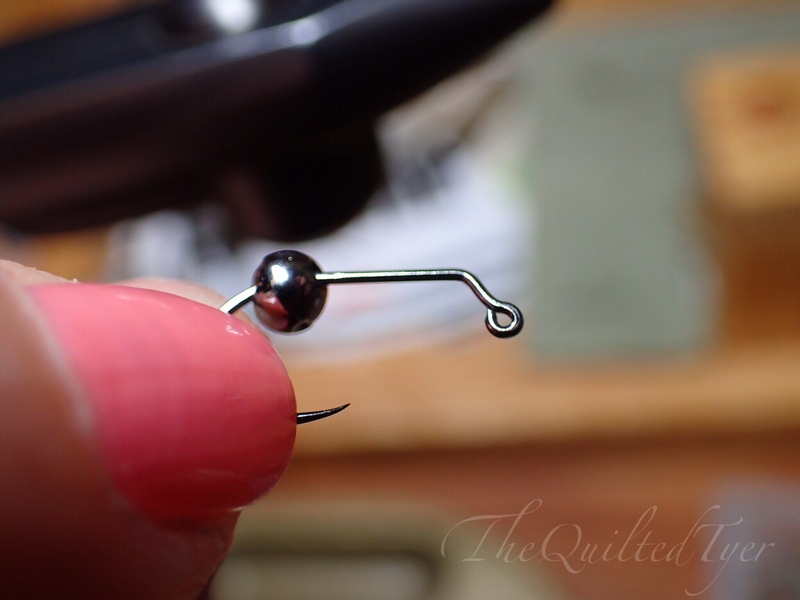 Normally I scoop the bead up from the palm of my hand with the hook point, and just place it in the vise. Since I wanted you to be able to see each step clearly, I have also shown the pliers and vise method. Some tyers who have trouble grasping beads and hooks with their fingers, can use try using that method below. 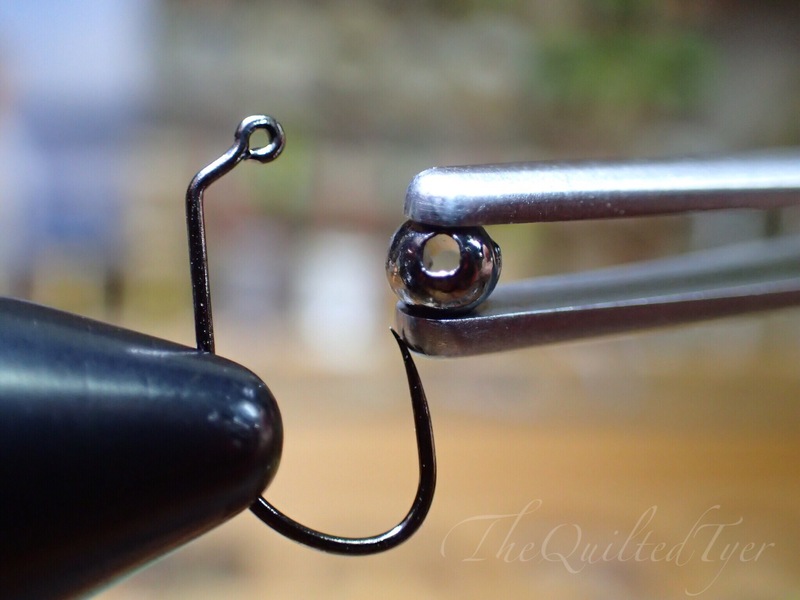 Before placing the bead on the hook, its good to give it a once over to be sure that it will sit on the hook properly. .. and the other side has the slot. 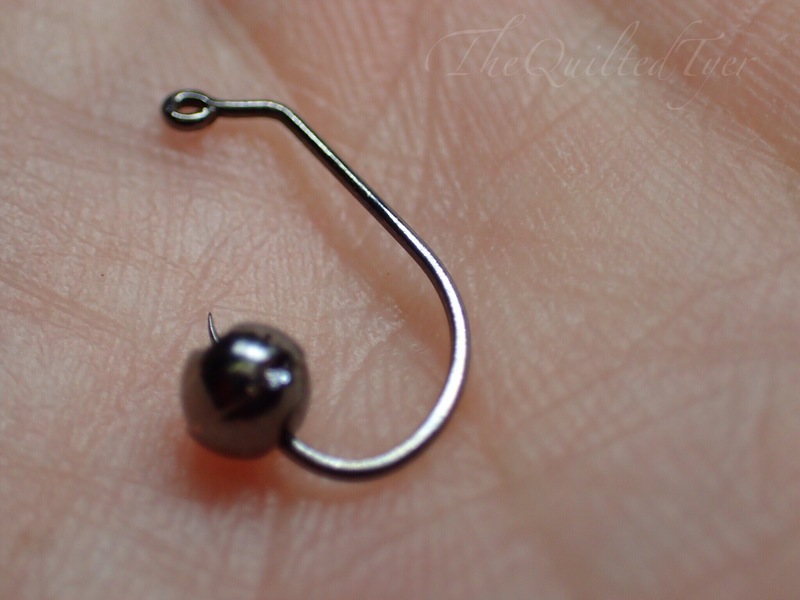 What you want to do is to place the bead on the hook using the ROUND hole as the end that goes over the hook point first. The side with the round hole is what you are looking for. This scooping method not only works for slotted beads, you can scoop any type of bead from the palm of your hand. Drop the bead in your hand, once again remember to find the side with the round hole. 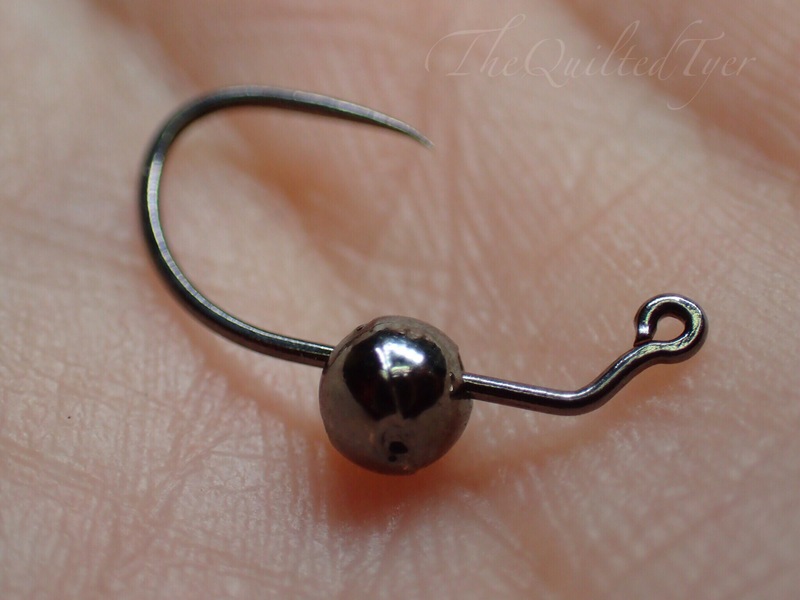 Hold the hook in the fingers of one hand and scoop the bead through that round hole using the hook point. On there? 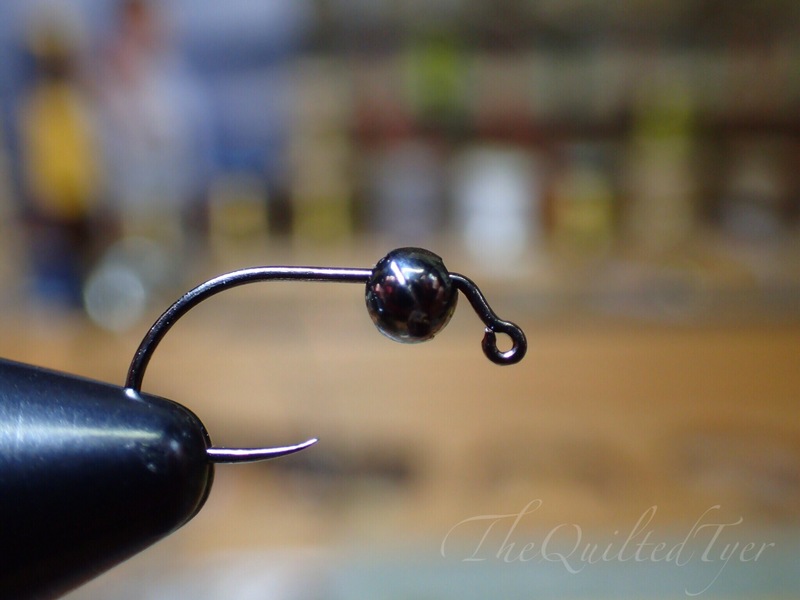 Now simply pick up the hook/bead combo and place it in your vise. Before we get into making sure the beads is on there correctly I want to make sure everyone is on the same page. If you had trouble with “The scoop” technique and need a better grasp on the materials, please see the step-by-step below for the pliers and vise method. This is a method that we have used in our PHWFF group before. 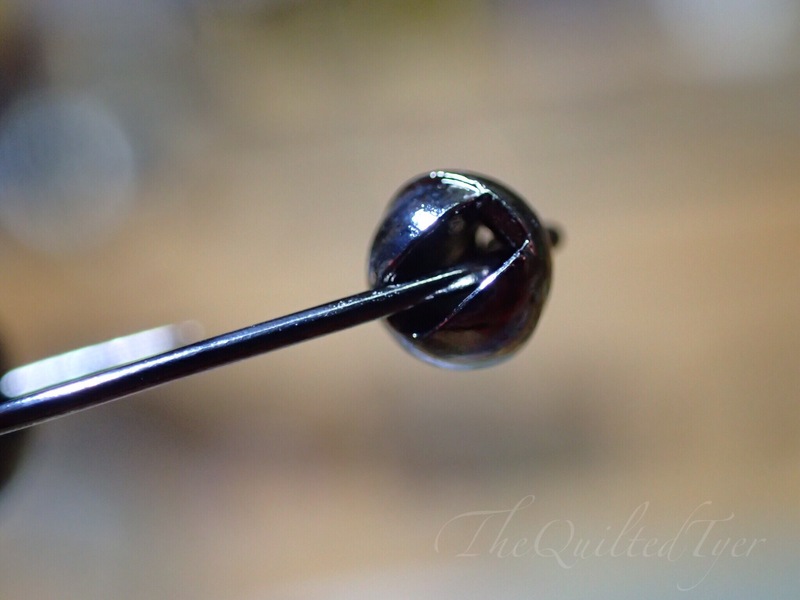 Keep in mind these methods also works for any beads which are giving you trouble, not just slotted. I know that we have used this method in our PHWFF group when some participants needed a little extra stability using the materials. 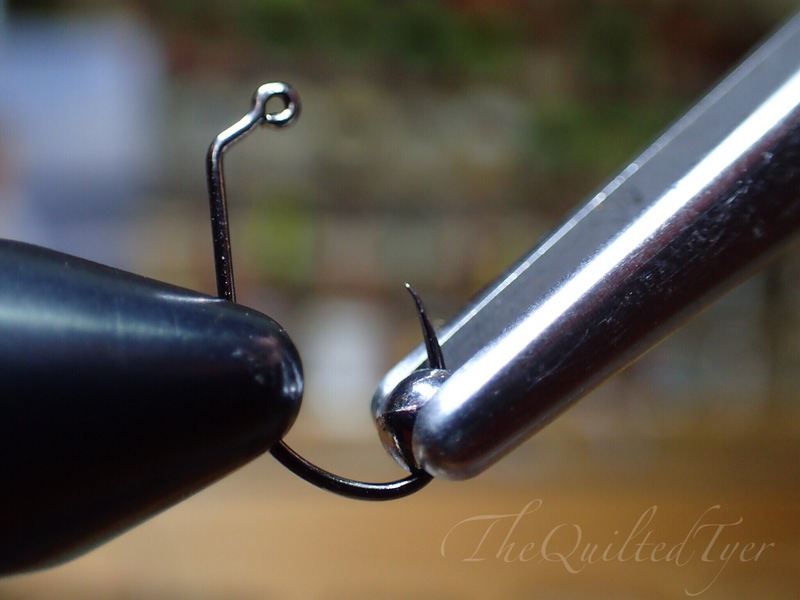 Now remember, you want to use the round side as the side that goes over the hook point first. Slide the bead on, using pliers or your fingers. 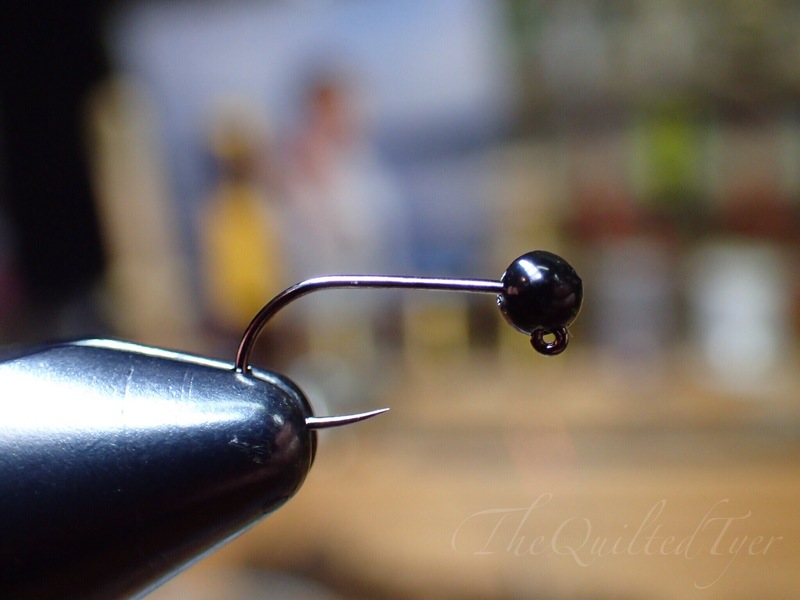 From this point you can take the hook out of the vise, hold it into your fingers and slide the bead up the shank. 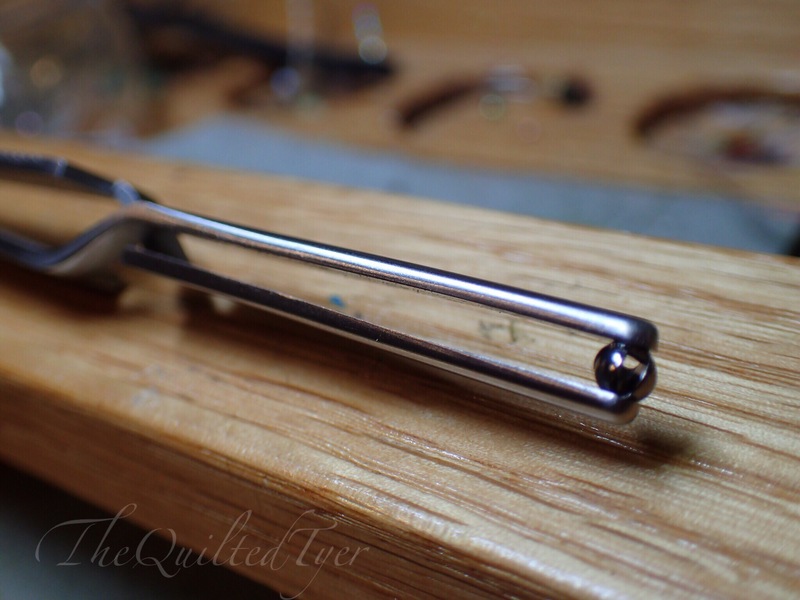 Then place the hook back into the vise, and begin your pattern. 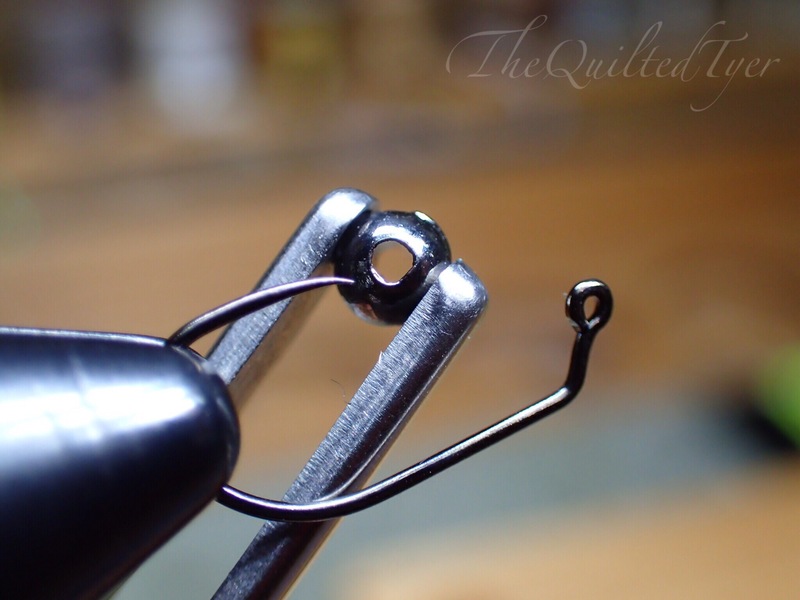 Placing the bead onto the hook correctly is only the first step, as you will now need to properly align it onto the front of the hook. 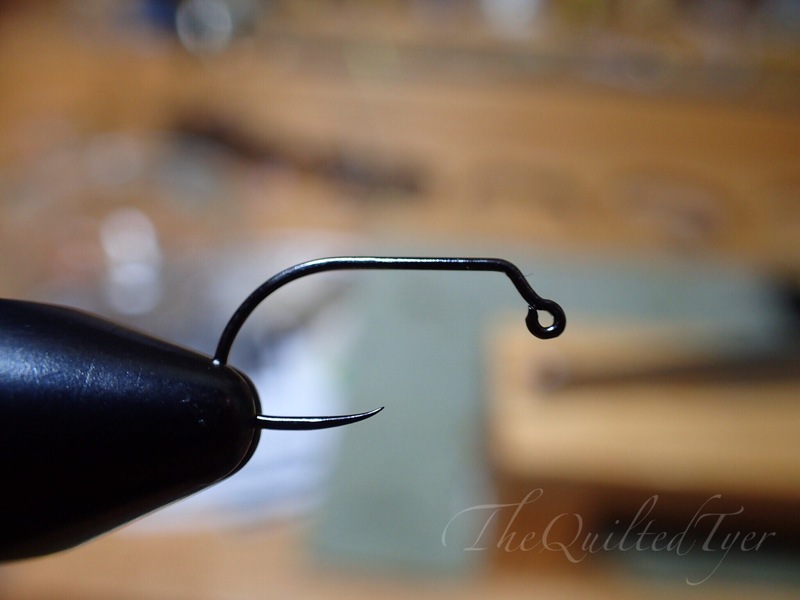 Affix the hook back into the vise. Slide the bead forward to the eye. 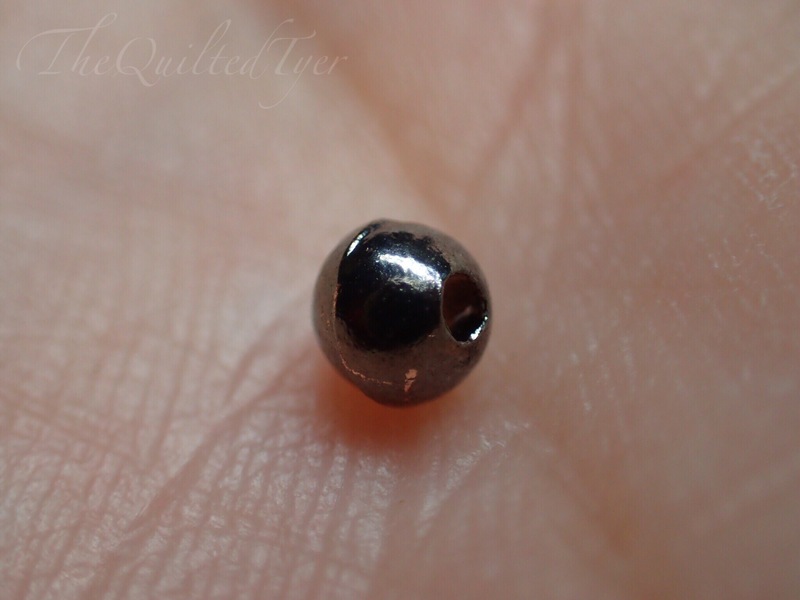 Take a close look at the back of the bead after you have brought it to the hook eye, you should see the slot clearly. This photo below is the proper placement you are looking for. If for some reason this isn’t what you see, then take a look at the troubleshooting tips below for extra help. 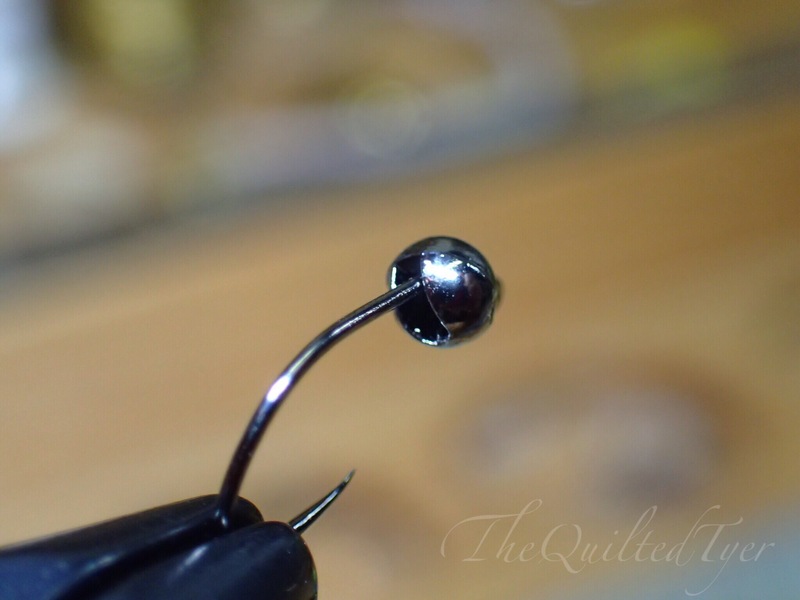 If you have followed thia step-by-step, your bead is more than likely ON the hook correctly. But that doesn’t mean its SITTING correctly, and this is where tyers tell me they have a lot of trouble. This is the proper placement of the bead. 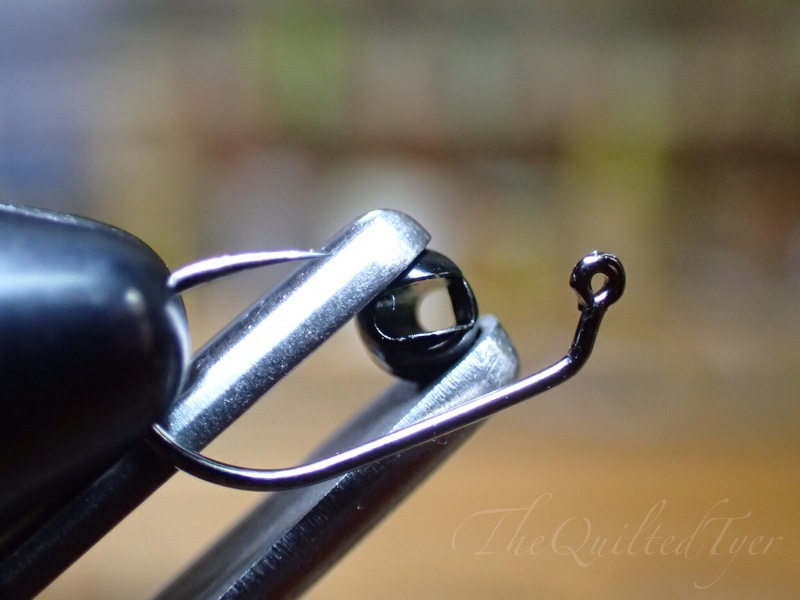 This is the profile you’re looking for, when rotating that bead around the hook. If you’ve ever spin fished or ice fished you may recognize the look of this. 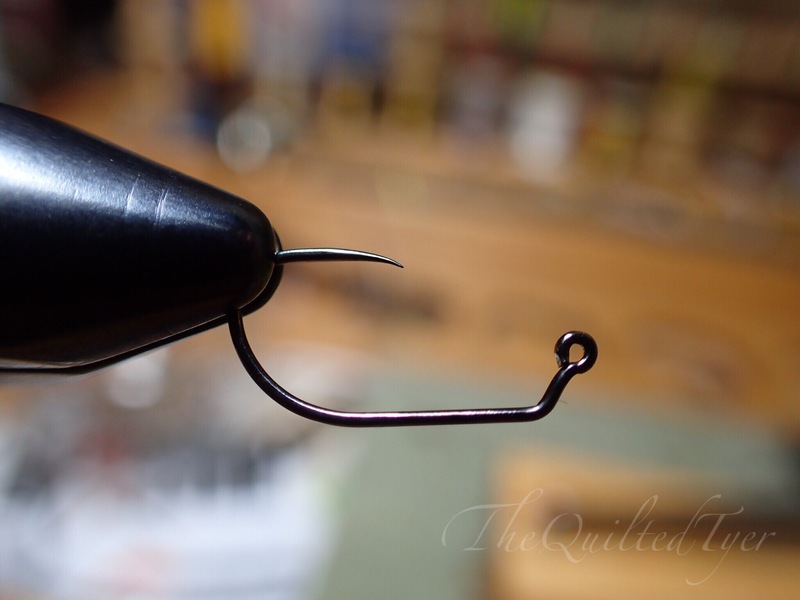 Its the profile of a normal jig hook in which you were going to attach a rubber trailer to it for your spinning rod. You would buy them just like this, already pre made at a store. 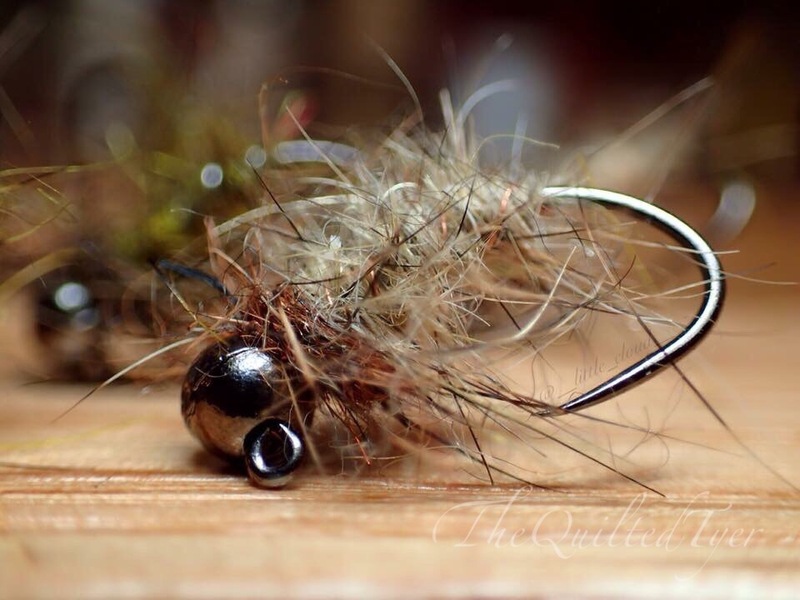 If your jig/bead combo looks like that then you are ready to start tying. If yours does not look like that, then take a look at the photo below. This looks right at first, but needs to be rotated. If you were to continue tying with it you would notice your fly was crooked. If you are seeing placement like this, then all you need to do is grab hold of the bead with your fingers, and rotate it. 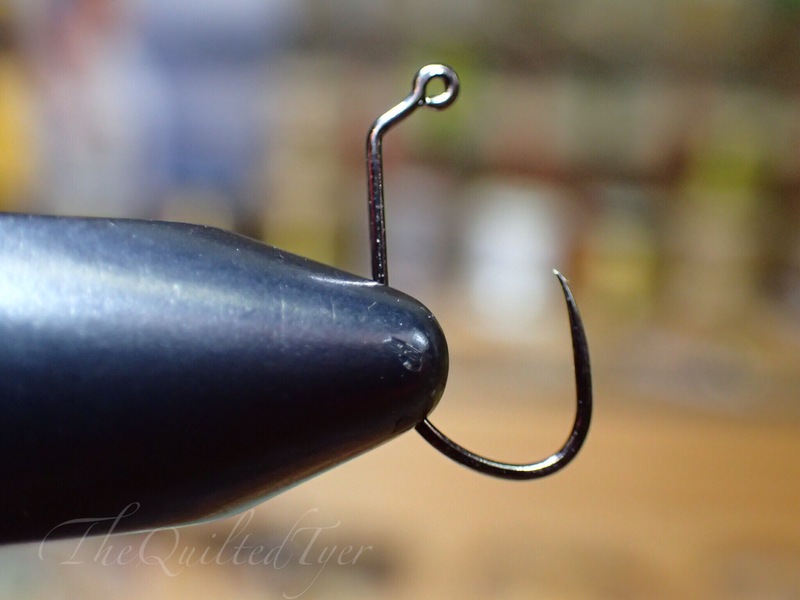 Spin the bead in your fingers around the hook until the slot slides over the hook bend. You will see and feel it fall right into place. If your bead/hook combination looks NOTHING like these, then you may have the bead on backwards. I am going to place it on wrong now so that you can see what it looks like when its done incorrectly. Its always great to see how to do something the right way, but I think it also helps to see how to do it incorrectly. Habitual Line Crosser: Yeah you, That’s right.. put the wrong end on! Slide the slotted end on first. Yep I know… that’s wrong, but do it anyway. andddddd.. hahahahahhah what the heck happened?! As you can see there’s no way to tie on this, the eye is completely covered and it slides allover on the hook. 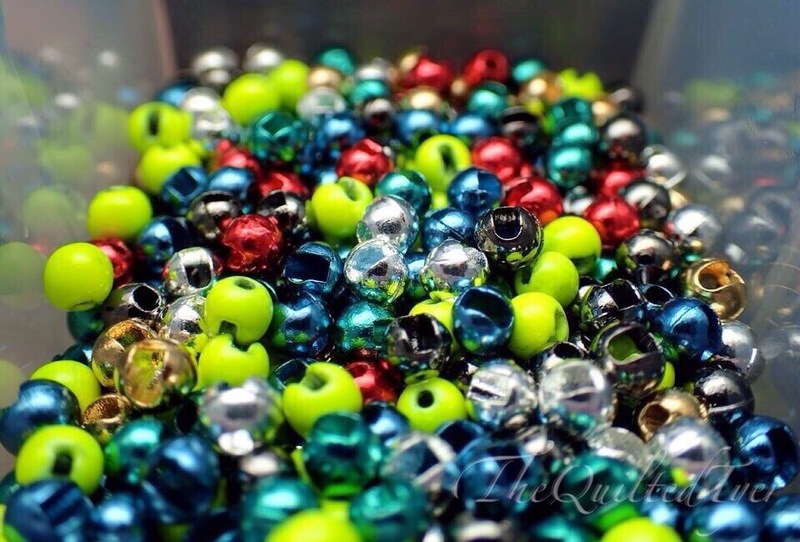 I hope these tips have helped you solve any issues you were having with slotted beads, and as always, if you have any questions please leave them in the comments and I will be more than happy to help! 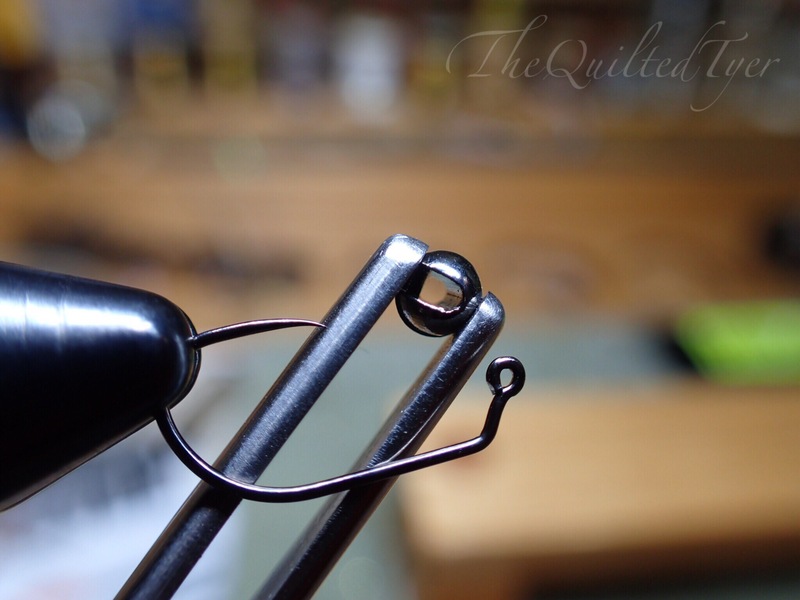 If you are tying a lot of jigs, try to assembly line them as seen below. It will help streamline your work!